Here I have compiled down single life quotes i.e. quotes about being single or being lonely. Just hope you like this quote compilation and share some of it's quotes. 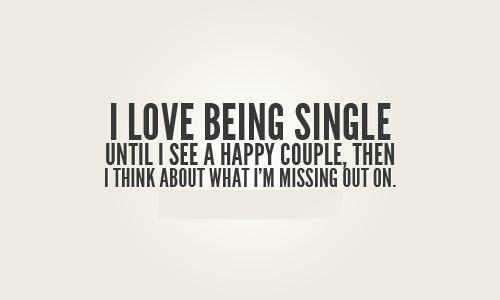 I'm perfectly happy being single...Until I see a happy couple. I'm not single. I'm not taken. I'm simply reserved, for the one who fits the word deserving. Being single doesn't always mean you are available, sometimes you have to put a DO NOT DISTURB sign on your heart. Roses are red, violets are blue, pizza costs less than dinner for two. I get so lonely, but I cant let just anybody hold me. They always say you must be patient, for you do not find true love, but true love finds you. What they don't say is how to handle going unnoticed your whole life and expecting to be found. I dont mind being single, I just miss having someone hold me. Being single won't give you 100% happiness but it will keep you from the pain. My life is like a romantic comedy except there's no romance and it's just me laughing at my own jokes. Single as a dollar and not looking for change. Sometimes, its ok to be single and just go and hang out with people. Yet, it sometimes stinks when you have no one to be with to talk to at night, hold hands, and be happy. You just have to have patience, and wait to see what happens. I see those couples, so in love. Makes me wonder if I'll ever be like that.